DES MOINES, Iowa (WHO/NBC) – In historically cold weather, there are no days off for firefighters and perhaps no job is made tougher by subzero temperatures. 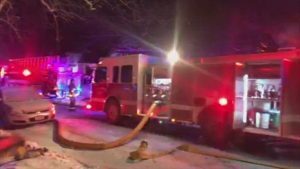 Des Moines, Iowa firefighters did everything they could to stay warm while battling a house fire on 36th Street during the lowest temperatures the state has seen in years. The extreme cold is tough on the firefighters, their trucks and equipment which made the fire even harder to put out. To make the ground easier to walk on they carry sand and salt on their trucks and usually have to call public works to bring in more. No one was injured in the fire. The homeowners have been temporarily relocated.